Fluorescent paint can be seen flying across the Music and Communication (MU) building’s lawn as students dance to whatever song the DJ is currently playing. Not a clean white shirt can be seen as students are sprayed with bright pink, yellow and blue paint. The smell of paint, blinking lights, and music fill the night air as students enjoy their Friday night. This event, held on Sept. 15 from 7-9 p.m. was a great opportunity for students to enjoy one of the last summer events before fall officially begins. Early into the night, students can be seen dancing and mingling with one another. A freshman, Honor Fournier, can be seen talking and dancing with friends. The Paint Party isn’t Fournier’s first event at Cleveland State. After going to other events hosted by CAB, like the “Sun Festival,” Fournier was excited to go to another event. Going out and spending some time with friends is something Fournier enjoys doing and going to campus events like the Paint Party is Fournier’s chance to do so. For Annemarie Jarachovic, who planned the Paint Party, this was a good way to have students enjoy a fun night out. According to Jarachovic, the event was originally going to be held during the spring semester, but it was rained out. After deciding to try the event again, Jarachovic hoped it would draw a large crowd since the last event she did —CAB’s Block Party — had a turnout of over 400 people. While the turnout wasn’t as large as the Block Party, it was still quite the crowd. As more students filled the fenced in lawn of the MU Building, they could be seen going over to the different tables that were set up facing the stage. At one table, students could get a white shirt if they didn’t bring one prior to coming to the event. After that, props like glasses, hats and light up glow sticks were given out. With the props in hand, students could be seen taking group photos and rushing over to get a good spot in front of the DJs’ stage, where they would soon be decorated with fluorescent paint. The paint that would be covering the students by the end of the evening was in buckets that were sat behind the stage. As the event began, it didn’t take long for paint to start flying. Glow Rage, the DJs who brought the paint and music all the way from Pensacola Florida, got an early start to covering students with the bright colors. Using large super soakers, the DJs and members of CAB, began to soak the audience in paint. At one point, one of the DJs poured a bucket of paint onto the heads of the excited crowd. While the DJs wanted to wait for the sun to go down before really wanting to get the party started, they did choose random moments early on to shoot paint into the crowd. It was moments like this, or the times when the second DJ would stop a song so the crowd could sing by themselves, that allowed students to really begin to enjoy their night. After hyping students up to what was to come later in the evening, Glow Rage soon delivered. As the evening progressed, more paint was thrown into the crowd. Students could be heard cheering as more paint coated their now multicolored shirts. Some students could be seen running in and out of the crowd in the hopes of not getting covered in too much paint, while others, like the people in the front row, could be seen with beaming expressions as the DJs reached for more. Regardless of how much paint the students got on them, the fun and energetic atmosphere that was created by this event was present well into the evening. The energetic atmosphere even drew the attention of people who were walking past the party. Some people even stopped to inquire about the event and to see if they could join in on the festivities. While they couldn’t actually join the fun, they did take advantage of enjoying the music playing as they walked by. One woman even sat with her niece at the picnic table, set up near the lawn, watching as the event drew to an end. 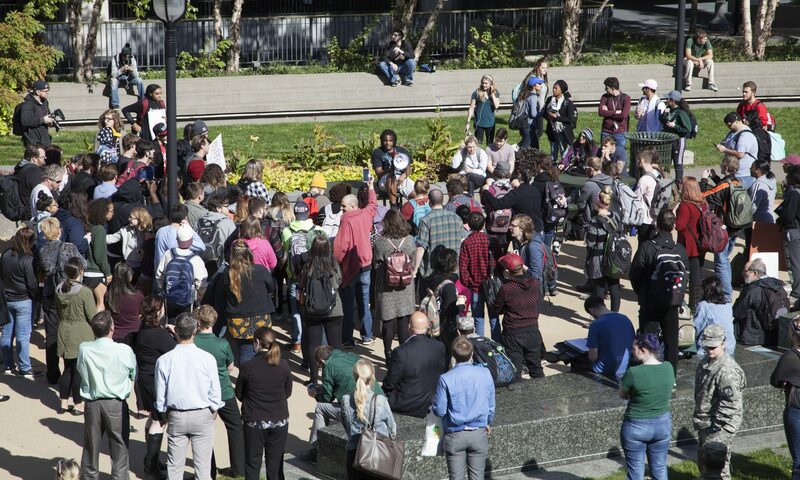 As the event started to come to a close, students could be heard making plans to meet up later in the weekend to spend more time together before classes on Monday. The white shirts that they once came in with were now covered in bright splatters of blues, yellows and pinks.